The General has been making some pretty interesting vehicles in the past couple of years, vehicles that should put the lie to the perception that it just isn't competitive. The Chevy Malibu and Cadillac CTS, for example, are fine vehicles. Now along comes the Chevy Traverse a fully featured, three row Crossover (I'd call it an SUV except I'm afraid of being tarred and feathered by enviro-wackos) that's a very compelling vehicle. 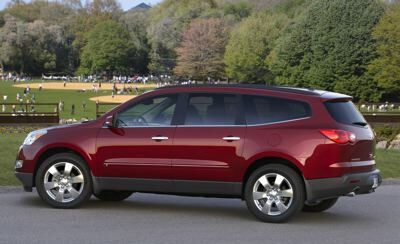 New for 2009, the Traverse comes in LS, LT and LTZ models, in front-wheel-drive and all-wheel-drive form. My test unit was the LT AWD and be darned if I didn't like it a lot. It's handsome, drives well, has plenty of room and sports just about any feature you'd need. It's a big vehicle, but it doesn't look it, thanks to a tight body with minimal overhangs and wraparound fascias. Fit and finish on my test unit seemed just fine. Traverse's front end displays "the new face of Chevrolet" with its distinctive grille that hearkens to the successful Malibu, and the overall look is aerodynamic and clean. I thought its bum looked a little Mazda CX-9-ish but not too badly – and the CX-9's a fine looking vehicle anyway. The big Chevy gets its motivation from a 3.6 liter direct injection V6, which the company says is rated at 288 horsepower and 270 lb.-ft. of torque with the optional dual exhaust (281 hp and 266 lb.-ft. with the single exhaust), which is nice and competitive. Ninety percent of the engine's peak torque is available from approximately 2,500 rpm. Obviously, get up and go is a non-issue. I didn't have a lot of opportunity to wind it out, since I had the Traverse during extreme cold weather when the roads were like skating rinks, but when I wanted acceleration it was there, no sweat. Power gets to the wheels via a pretty smooth six speed automatic transmission with automatic grade braking, shift stabilization and precise shift control. It also offers a "pretend manual" setting, though it's just via a "+/-" button on the shifter and doesn't really offer any enhanced driver involvement. Handling is pretty good. You never forget it's a reasonably large vehicle, but neither does it feel like a boat. The crossover's held up by independent front and rear suspensions, the front of which features a MacPherson strut design, with a direct-acting stabilizer bar and aluminum knuckles while the rear has a linked “H” design, which uses an isolated mounting system to reduce noise and vibration. 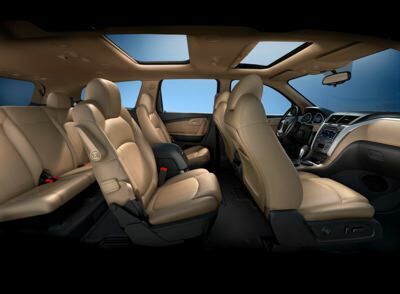 GM says it has minimal intrusion into the floor pan, which enhances passenger and cargo space, of which there's plenty. The suspension isn't boatlike, but it is just a tad floaty for my taste. A "sport" setting may have helped here, but such was not to be. Brakes are discs with ABS all around and the pedal feel is just right. Stopping power is just right, too. Power-assisted rack-and-pinion steering is standard; variable-effort steering is available. Four-wheel disc brakes with ABS are standard on all models. Additional standard electronic braking features include Dynamic Rear Proportioning (DRP), Hydraulic Brake Boost (HBB) and Panic Brake Assist (PBA). DRP optimizes front to rear brake balance by dynamically adjusting the rear brake bias based on driving conditions and vehicle loading. HBB amplifies the hydraulic brake force to reduce stopping distances under low or temporarily low engine vacuum conditions. PBA adds or maintains brake pressure even if the driver backs off braking during a panic or emergency situation. Electronic nannies, all…. My test unit came with satellite radio, navigation system, Bluetooth hands-free phone connectivity and the reasonably good-sounding Bose audio system also handled my DVD-Audio discs. Driving the Traverse is a decent experience. The driver's seat is comfortable and the driving position, aided by tilt/telescoping steering, is just right. The outside mirrors are large and mounted so as to prevent blind spots – and a nice touch is the little convex sections on them for blind spot elimination, a nifty and low tech solution that worked well (though they could be a tad bigger). 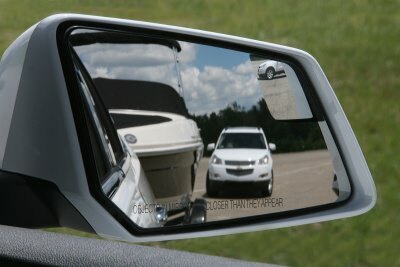 The Traverse has pretty big A pillars that cause a bit of blind spot. And the B pillars are right at the shoulder, which always makes me feel a bit claustrophobic. But these are quibbles. I wish they'd change wiper/lights position from being a combined "Superstalk" on the on left side of the steering column (a complaint I have with the other "Big Three Domestic" manufacturers as well). I prefer a separate lights stalk on the left and a wiper/washer stalk on the right of the column, though I imagine you'd get used to this configuration quickly enough. The rear wiper control is a rocker button on bottom of center stack, which makes it a bit out of the way and a tad counterintuitive, but it works fine. 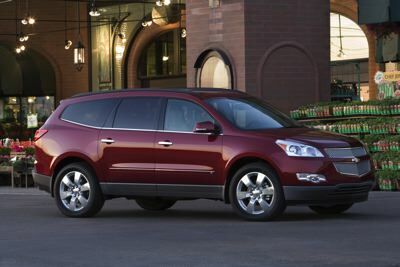 The Traverse features automatic headlights, as every modern vehicle should. The steering wheel feels good in the hands (and the steering itself feels just right), and it has the audio system's volume control mounted behind it, kind of like where a paddle shifter would be. Only the driver's window offers one touch down operation, and it won't auto up again. The driver's seat features eight way power control. The touch screen interface is beautifully done, maybe the best I've tried. It uses index card-like tabs to access the various functions (AM/FM, disc etc.) and it's laid out beautifully. It also only requires a soft touch on the screen to activate, unlike some touch screens you really have to poke at. Getting in and out of the rear section is efficient, and thanks to a second-row "Smart Slide" feature you have decent access to the third-row seats – a row that's pretty comfortable, all things considered. I thought it gave more leg and knee room than the third row in the big Lexus LX 570, which surprised me. Both rearward rows fold flat for better hauling of your stuff. They don't fold into the floor, but they do provide a nice, flat surface – it just isn't as high as you'd get in a minivan. Another nice touch is the power-operated tailgate. Besides the regular tilt/slide sunroof up front, there's a non-opening one for the center row of seats, which is great when you're driving through the mountains and want to see the peaks. Passengers in second class and steerage can take advantage of an optional rear seat entertainment section, which is pretty good. Alas, when it's down, the DVD screen obscures just about all the area of the rear window that the rear wiper clears, a minus for the driver. This is a good argument for teaching the kids the joys of good music (especially since the satellite radio provides so much great stuff). The middle row seats of my tester were captain's chairs (the eight seat model has a bench), and its side windows retract all the way down into the door. I also liked the Traverse's excellent windshield washer spray, which hoses down the window beautifully, and its three zone HVAC, which has nice and easy to fathom interfaces. The days of GM vehicles being acres of cheap-looking plastic buttons appears to be over, and that's a good thing. Safety equipment includes six standard air bags, including side curtain air bags that deploy over all three seating rows. And the usual other belts and stuff, of course. 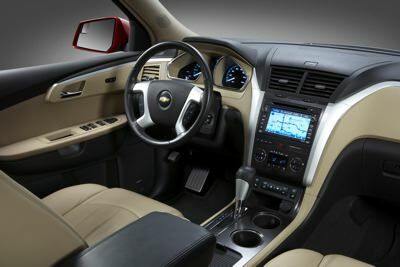 The Traverse is a very nice vehicle and I can see why people looking for something in this market segment would give it a try. The Chevy Traverse 2LT AWD starts at $37,190 U.S./$45,220 Canadian. The base, FWD model starts at $29,990 U.S./$35,620 Canadian.